​ The adventure at Capilano Suspension Bridge Park in North Vancouver continues to reach new heights! Treetops Adventure, one of the most popular experiences at the park, is the first venue of its kind in North America. The multi-award winning attraction is currently being raised by 10 feet to give visitors an even more spectacular view from up to 110 feet above the coastal forest floor. 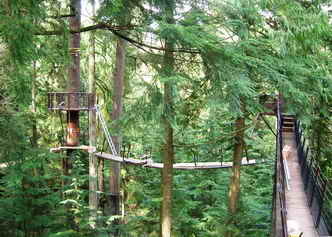 Treetops Adventure is a series of platforms and suspension bridges attached to eight 30 ton, 250 year old Douglas-firs. Originally built in 2004, the innovative and award-winning Treetops Adventure was designed to accommodate the continuous growth of the trees. The viewing platforms are attached to an innovative tree collar system that is adjustable and moveable and has no nails or bolts penetrating into the Douglas-firs. It is unlike any canopy walk in the world. Over the past 10 years the trees have grown in circumference requiring that the friction collars be loosened and moved up in order to maintain the excellent health of these majestic trees. 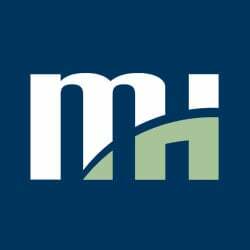 Morrison Hershfield Limited is currently providing structural design, construction inspection and load testing services for this project. Solid Rock Steel is fabricating steel components and Marc-Luc Lalumiere is constructing the new platforms and bridges. Treetops Adventure upgrades are scheduled to be completed on April 30th, well ahead of initial estimates thanks to inventive construction staging techniques utilizing the existing bridge as a work platform for construction of the new bridge overhead. Once complete, visitors will be able to venture from one magnificent Douglas fir tree to another on a series of elevated suspension bridges, some reaching as high as 110 feet (33.5m) above the West Coast Rainforest floor. Recognized for extraordinary innovation with national and provincial tourism and engineering awards, a walk on Treetops Adventure has emerged as one of Vancouver’s quintessential activities. Morrison Hershfield Limited continues to proudly work with Capilano Suspension Bridge Park as a trusted advisor on a number of other projects within the Park.